Rugged 10 oz. industrial bags allow airflow and absorb moisture, oil, and grease. Use for storing and shipping metal parts, fittings, castings, hardware, and for use as sand bags. 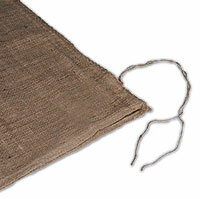 Burlap bags with tie string closure makes opening and closing easier.